A little background: my parents are in town visiting for a month. They drove from Kentucky to Los Angeles to both explore the area and visit the Hubs and myself, see our places of work, our house, etc. My mom likes to think that she gave me her "designer jeans" since she herself is an interior designer and quite the painter/illustrator (my brother also went to art school and is in the film field). That said, yesterday I went home all excited about discovering the name of my beloved fabric (see yesterday's post). I showed my mom my new blog entry and, before I told her the story behind it, she said, "Oh, yeah, that's Marimekko." Turns out she knew it all along. Arugh. Anyway, Mom had a gift waiting for me from her recent trip to the Getty: an Andy Warhol book! You can imagine my excitement, especially since I, as stated yesterday, LOVE big and bold, and REALLY, really love modern and pop art. The book was laying next to a pair of earrings I recently made. My mom and I did a double take when we noticed them next to each other - they went together PERFECTLY! Needless to say, I got a little carried away with the idea of combining pictures in the book with some of my new jewelry items :) Come to think of it, I am pretty sure I have enough Andy Warhol prints, dishes, bags, postcards, etc. to exclusively photograph all my future jewelry on top of Warhol art. I am sure the copyright police wouldn't mind ;) Click on the image to see the corresponding Etsy listing. Whew! On top of that, I had some fun with color today and made an Etsy "poster sketch" around my new Lime and Cherry red Turquoise, Cinnabar, and wood necklace (click here to make your own Etsy collage - this is how treasuries are made, my friends). I love these colors! Can you play Where's Waldo and find my item? I not only made the necklace and the poster in these colors, but have these colors all over my house, too (call me OCD, I'm fine with that!). 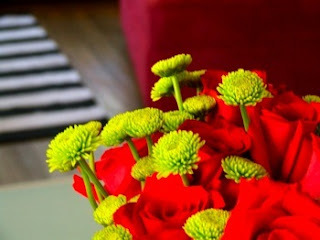 I never used to care for red and green, but, like your taste buds, visual tastes develop over time! (These roses and Pods were my Christmas centerpiece!) And speaking of taste, ArtGrants has it - she included me in one of her latest treasuries! Thanks, Bari! I am headed to my alma matter in Berkeley and San Francisco this weekend. Sure, I am going there technically for a conference, but REALLY I am going to do some M A D S H O P P I N G in Chinatown's "going out of business" jewelry stores (they seem to all be going out of business, all the time). Alas, I didn't know the great resource I had in these stores when I lived in Berkeley. We are talking pearls, findings, crystals, beads, etc. Watch out, Chinese ladies, here comes a white Chinese-speaking super shopper! Can't wait to see what kind of things I buy and subsequently create! 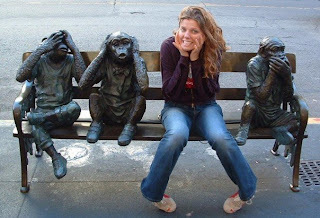 (Me and the monkeys at the entrance to Chinatown on Grant Street. Silly, San Francisco). I was trying to figure out what it is that I love about your posts. I mean, besides the fact you are absolutely adorable and we have this great off-blog reparte. And then I realized that I really love the visual pop you add to your posts. Like you, I am a very visual person. And I don't necessarily associate blogging with being visual. But, I could sit and dreamily stare at your blog posts without ever reading a word. I consider those icing on the cake. Have a great weekend, dear! Wishing you have wonderful time with your parents and family!